For today’s Throw Back Thursday picture, we have the recommended March fashions from 1846. Would you like wearing any of these dresses? This image comes from a collection of fashion plates that you can learn more about here. We also invite you to explore the rest of the digitized collection, provided by University Library Digital Initiatives. Maybe you’ll get some inspiration for a new spring or summer wardrobe! To celebrate Spring Break, I present the most fashion-forward swimwear of 1917. 100 years ago, this is what the young ladies of Iowa State may have worn on their beach vacations. Of course, spring break as we know it now did not exist in 1917, though there was a 3 day Easter vacation. This picture is a magazine cover found in the collection of covers and fashion prints collected by Mary Barton. You can browse the digitized images of fashion plates from this collection. I know everyone will be clamoring to get their hands on this swimsuit! Have fun and be safe as you finish up Spring Break! Last Saturday was the 34th annual Fashion Show. 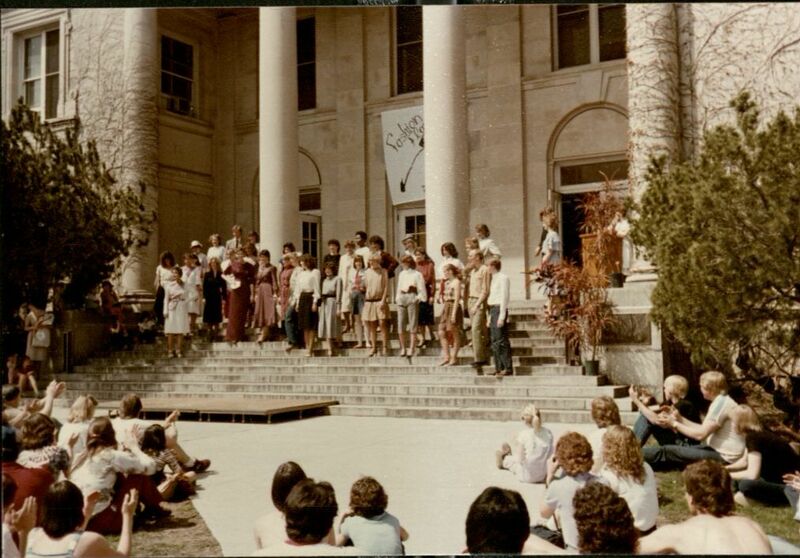 The picture below is from the first Fashion Show in 1982. The Fashion Show is one of the largest fashion shows run by students in the United States. More than 150 student-designed garments are featured on the runway and in the exhibitions. Drop by the reading room and look at the Fashion Show Records (RS 29/2/4). We’re open Monday-Friday 10-4! Here is another feature from the History of Costume collection! This time we have an example of costuming from the 16th century (presumably England). These fashion cards come from just one folder of the collection, and cover ancient Egyptian fashion through 17th century European. An example of 16th-century fashion. RS 12/10/5, Box 2, Folder 4. Click here to download and print the page – happy coloring! When I woke up this morning, the news stations were reporting that with the windchill, it was 9 °F outside. I don’t know about you, but the stylish winter fashions above don’t look nearly warm enough! The image above, and others like it, are available online in the Fashion Plates digital collection. Join Us at the “Bomb” Transcribe-a-thon! Digital Exhibit on Iowa’s State Parks System Now Available!